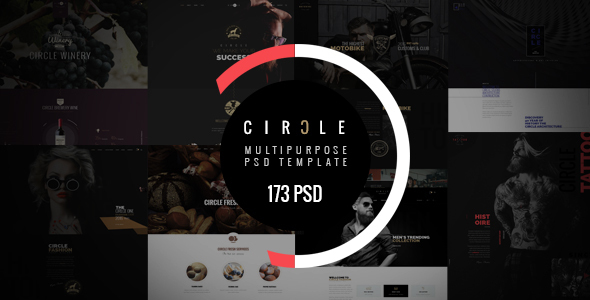 “CIRCLE – Creative Multipurpose PSD Template” is modern, clean, multiple functions and professionally. It has 42 homepage layouts and 25 Online store layout Options! This template suits for any type of portfolio, creative, corporate, agency, bussines, design studio, fashions,hair salon, photography, gallery photo, architecture, interior, medical, tattoo club, motobike club, restaurant, wine, bakery, cafe, sport, gym, app, Blog, shopping and more… The psd is designed on grid and can be easily conversion into responsive HTML,Wordpress, Joomla and other systems. This is a perfect choice! 173 PSD files included – The design is very easy to customize. If you like my theme, please rate it 5 stars. It’s very useful for me. 25 Online store layout Options. 47 Portfolio Detail Layout Options..
01 loading page layout Options. This PSD theme is perfect for website project of Corporate, Agency, Bussines, Creative, E-Commerce, Personal Portfolio, design studio, Fashions design, Hair salon, Interior design, Architecture, medical, tattoo club, motobike club, restaurant, wine, bakery, cafe, sport, gym, app, Blog, shopping, WordPress, Joomla and other systems.